As 'Pro Embed' tour upgrade provides you with numerous settings, we have implemented 'Layouts' feature, which helps to reuse 'Pro Embed' settings. 'Layout' is a settings template. It contains all the branding and appearance settings and can be applied to any of your embedded tours with purchased 'Pro Embed' tour upgrade. All the layouts are available in the 'Pro embed' settings. How do I change the saved layout? Layouts can be updated easily. 3) Choose the layout you'd like to update and apply it. Please note, if you change the previously saved Layout, it affects all the embeds you have made using this Layout. 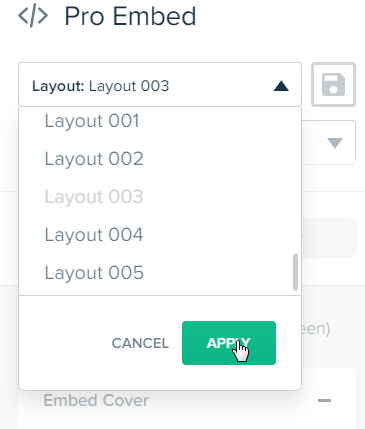 If you are not sure if your layout changes would affect any of your existing embeds, we would recommend you to save the updated Layout with a new name. You are not limited in number of layouts you can save. Can I save the Starting Panorama and Embed cover using 'Layouts' feature? Starting Panorama and Embed cover settings are not saved with the Layout. These settings affect the embed code you obtain. The unique embed code is generated for every possible combination of Starting Panorama, Embed cover and Layout set.